River-dominated estuaries (also known as salt-wedge or highly stratified estuaries) are transitional water bodies occurring in micro-tidal coasts such as the Mediterranean. Their hydrological and ecological particularities make difficult the assessment of the ecological status using either the procedures for rivers or estuaries. For instance, river-dominated estuaries become rivers when the discharge is higher than its annual average (riverine conditions), whereas they become highly stratified when discharge is lower than its annual average (estuarine conditions). Moreover, the transition between riverine and estuarine conditions is abrupt and irregular across space and time, converting these transitional water bodies in naturally stressed ecosystems. To add more complexity, the human intervention in river basins (i.e. damming and intensive water use) has tended to reduce and homogenise river discharge, making more frequent and regular the presence of a salt wedge in the estuary, softening their natural stressful dynamics. As a result, it is difficult to discern natural from anthropogenic stressors, because the increase in environmental stability leads to higher complexity in biological communities and thus some bioindicators may show scores indicating better ecological status under impacted conditions than under natural conditions, which is an expression of a phenomenon known as ‘estuarine quality paradox’. To sort out this situation and achieve a proper assessment of the ecological status of river-dominated estuaries, a specific approach is required, both in terms of the bioindicators to be used and the methodology to make them work in the correct way. 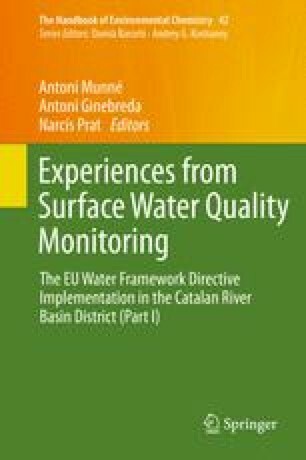 In this chapter a synthesis of preliminary work carried out to develop assessment methods (according to the Water Framework Directive) in the Ebro River estuary is presented, and the strategy to further develop the best methods to carry out the ecological status assessment is discussed. The Ebro River estuary is a typical salt-wedge estuary which is representative of this type of water bodies in the Mediterranean, and its hydrology and ecology have been intensively investigated in the past. Results show that existing bioassessment methods for transitional waters are not appropriate for the assessment of the ecological status of river-dominated estuaries, though in some cases the adaptation of some methods can be a useful way to start with the assessment as long as limitations are known. This study was supported by the Government of Catalonia (Catalan Water Agency). The authors would like to thank to Lluís Jornet, David Mateu, Sílvia Rodríguez, Mireia San Lorenzo Rosa Valmaña, Esther Clavero and Cristina Buendía for field and laboratory support.